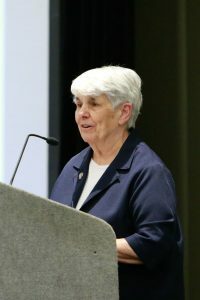 “Mettre la table” by Sr. Paule Freeburg, D.C.
Talk given by Sr. Paule Freeburg, D.C. at the 2017 LCUSA National Assembly. A culture of encounter demands that we be ready not only to give, but also to receive. That’s our Pope speaking! To go to the home and have a conversation – and encounter. Both Pope Francis and St Vincent de Paul are talking about creating a culture of encounter – truly encountering the other at every opportunity. It’s about how we are with someone. Eyes meeting, ears listening. Truly BEING present to the other. *Otherwise we risk handing over money and inviting the poor to choose a sandwich and a coke from a vending machine. But WE, we are called to see Christ in the Poor we serve. There is no sending Christ to the vending machine. St. Vincent wrote in your first Rule. This handwritten rule is preserved in a glass case in the small chapel in the rectory in Chatillon. The door to Vincent’s room is just outside this chapel. Surely he prayed there, offered the Mass there. What a thrill that your first rule, written and signed by St. Vincent’s hand resides there. This little piece of that first rule in Chatillon – is for me – the ultimate Encounter that both Pope Francis and St. Vincent describe. This quote that I am going to read is the reason for the title of my talk in your program: Mettre la table. Let’s listen to how St. Vincent asks the Ladies of Charity to set the table for the Poor. Do you see how this was an Encounter: looking, conversing, touching. Because this was a poor sick person – that table was a bed tray. It doesn’t matter. It was that person’s table arranged with great care. Do you hear the detail on how the first Ladies of Charity were to set the table and serve the food to the Poor? This kind of detailed kindness was unheard of for the Poor. Most of the Poor stood in bread lines, soup lines. No one went to them. This kindness and sensitivity was envisioned by St. Vincent as a revelation. St. Vincent envisioned you, and the Daughters and the Vincentians (and now the SVDP society) as having an Encounter with the Poor. It’s up close and personal! IT’S EYE TO EYE. BUT THIS ONE DETAIL STANDS OUT! The Poor did not use napkins in their homes. Vincent never used a napkin when he was growing up in Pouy. The elderly Sisters in Belgium told me they came from villages and they never had napkins on the table. Where did St. Vincent learn to use a napkin? When he lived on the de Gondi estate. They were wealthy. He was tutor to their sons. They were nobles. Lords. They used napkins. When he ate at court (he was the confessor to the Queen and also served on the court appointed Council of Conscience. One of the purposes of this council was to name Bishops. The royalty live at Court. They used napkins. These people, nobles and royalty are Lords and Masters. HE IDENTIFIED THE POOR AS OUR LORDS AND MASTERS. We show that we see Christ in the Poor by how we treat them. Every time you take time with a Poor person, to look, to listen, to really Encounter – You are symbolically putting the napkin on the tray. You are encountering Christ. Every time you visit a sick person and stay awhile to look and listen, to converse, to really encounter the other – you are putting the napkin on the tray. Every time a Vincentian teacher takes time with a child having difficulty, time to look, to listen, to encounter, to really BE there, he or she is putting the napkin on the tray. Every time a nurse answers the call button, even if it is the 10th time, and asks smilingly, “What can I do for you “– she or he is putting the napkin on the tray. That “napkin on the tray” is the Vincentian Way of doing service. For that teacher, nurse, Lady of Charity, Daughter of Charity, Vincentian Priest or Brother, Society member, that Vincentian Way of service is “putting the napkin on the tray” for our Lords and Masters. Every time we meet the Poor – or anyone we are helping, it must be an encounter. We must keep our eye on the prize. And that prize is the person we serve, Jesus Christ.